Energy rates are high and continue to rise. Photovoltaic generates renewable and green electricity for your property at minimal cost. Save money now and lock in lowered rates with a system that operates for 25 years! Solaron is an experienced solar contractor, and we only use SunPower solar panels, guaranteed for 25 years of life. This makes for a winning solar combination for of our clients in Placerville. Everyone knows that installing solar panels lessens your electricity costs. 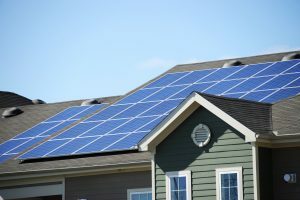 It is the upfront cost that scares most clients in Placerville away from immediately seeing their energy bill decrease, in some cases even down to zero. We will talk about costs in a moment, but now let’s discuss the environmental benefits. The Environmental Protection Agency calculates that the average American household uses almost 15,000 pounds of carbon every year only to provide electricity for their household. This shows that if you install solar panels, over twenty years you will go from dumping 300,000 pounds of carbon into the atmosphere to releasing a small fraction of that amount. So if you want your property to help alter the balance on global warming, solar electricity is a great place to begin. How else can Solaron make solar less expensive? By means of ongoing incentive programs offered by municipalities and governments! As these vary based on your specific area and energy company, talk with a Solaron sales representative today to learn about these potentially large savings!